As was previously announced the other day on this blog, the Mackerel billing system will be updated starting May 2019. A new unit called “micro hosts” will be applied to containers and some cloud components. The price of the micro host has been revised from the previous host unit, and will cost 648 yen (tax included). These revisions to the billing system will make it easier to use containers and various integration functions. For more details regarding the billing system and micro host components, check out the following entry. AWS Integration now supports SES. Check out the help page below for more on obtainable metrics and important notes. Detection conditions have been fine-tuned so as to avoid false positives in environments that have little variation from normal such as memory etc. For details regarding the Anomaly Detection for roles function, refer to the help page linked below. Changes were made so that memory.available can now be selected in role graphs. Custom dashboards and more can also be selected. There have been cases of lagging text input, such as contacting the support team, when a large number of monitors are configured in the Monitors page. This behavior has been improved. Since the recent release of the public beta version of Mackerel’s container agent, the number of cases used in container environments has increased. 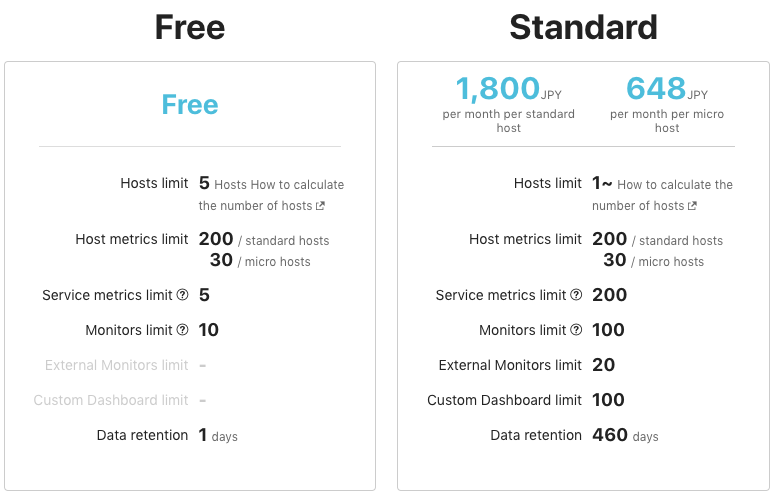 In Mackerel’s existing billing system, all components are converted into a unit called a ‘host’ based on usage, and calculated at a rate of 1,800 yen per host. The host unit has a strong connotation as equivalent to one server, and this concept doesn’t really match actual applications with recent container environments and cloud managed services. So, starting from May 2019, the billing system will be newly revised, dividing the existing ‘host’ billing unit into two separate billing units, standard hosts and a micro hosts. With the transition to the new billing system, there are no operations or procedures that need to be performed by the user. The new rates will be applied starting in May 2019, thus affecting the bill of June 2019. Below, we’ll go over some of the details regarding standard host and micro host units. Standard hosts will function similar to the current ‘host’ unit. 1 standard host will be charged 1,800 yen (tax included). The following are billable targets for a standard host. Micro hosts are a new billing unit. 1 micro host will be charged 648 yen (tax included). The following are billable targets for a micro host. Micro host targets that are currently being charged as regular ‘hosts’ will be automatically change to being calculated as micro hosts starting in May 2019. If you have any questions or concerns, contact the support team at support@mackerel.io. 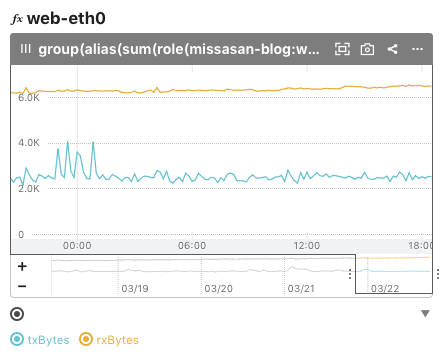 Due to popular demand, we’ve released a function for service metric interruption monitoring. Service metrics are versatile because they can be posted using the API without having to go through the Mackerel agent. With this release, it is now possible to detect when service metric posting gets interrupted and prevent the situation from going unnoticed. With Mackerel, you can post and visualize metrics from external services and applications that aren’t directly linked to a specific server using the service metric API. You can do this by hitting the API directly or with fluentd. Interrupted monitoring for service metrics is a mechanism to detect whether the process of posting these metrics gets interrupted for some reason. Sometimes stoppages occur with fluentd, and we’ve received feedback from users saying that it took them a few days to even notice that service metrics weren’t being sent. This kind of situation can now be prevented by configuring interruption monitoring. 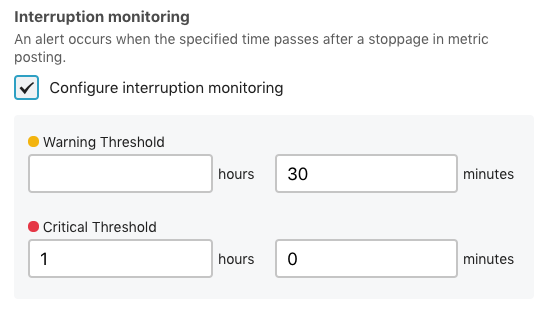 Configuring interruption monitoring can be done from the service metric monitoring tab in Monitor Settings or from the editing screen of existing service metric monitors. As shown in the image below, a graph legend can now be displayed on the bottom of expression graphs that are on the Graphboard which can be created from the service details screen.